A lot of time is spend going around shops too look for clothes and there are many factors to consider. Even after finding a "fashionable" piece of clothing, one still has to consider the availability of cheaper alternatives and how it complements your current wardrobe. What if, there was an application that could do all that for you! 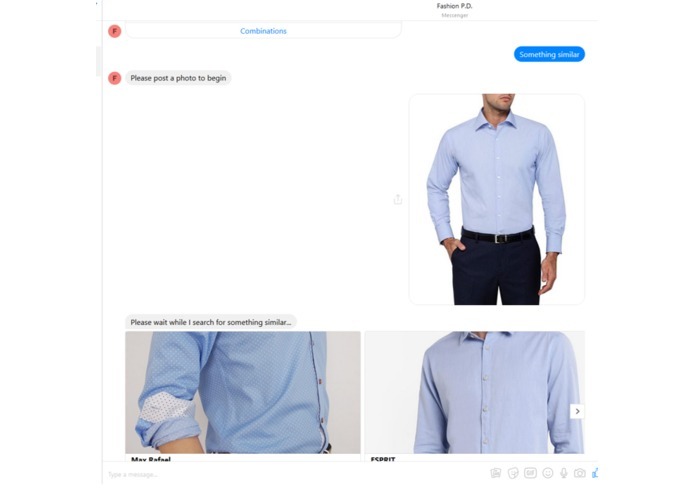 Our application, Max, allows you to upload photos of clothes you own or like and utilizes machine vision and a vast database of scraped clothes to find you cheaper alternatives or recommend matching clothes from your wardrobe. Due to the computational and time challenges in training a full machine learning model, we used transfer learning on the Inception model to train a classifier based on over 30 datapoints such as colour and style. This is hosted on an Azure server with a facebook messenger bot as a convenient and interactive front end. There are a still some bugs in deployment but we will get there ! The model has been trained and looks promising ! MVP is fully functional ! The model works well for Mens clothing as there is quite a high standardization like Tops, Bottoms and Shoes. Applying this to Women proved far more complicated. We could extend this to generate its own fashionable outfits ! We do have some base plans for this such as a vast database of runway outfits and plans for a Generative Adversarial Model to create novel outfits.